Welcome back, we hope you‘re all rested and ready to take on a new week on the 21 Day Challenge with Nile Wilson. Let‘s kick this week off with a bit of Cardio! There are several health benefits for doing cardio exercises, such as delivering oxygen to your working muscles, strengthening your heart and lungs and improving endurance. 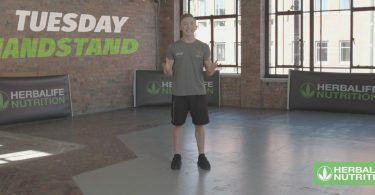 Here, Nile Wilson will take you through few exercises of Burpees, Floor Sprints and Squat Jump but don‘t worry if you want to take it slower with a more basic version of the exercises, just follow Emma‘s in the video! We strongly recommend to warm up properly each time you perform a workout to avoid the possibility of any injuries or unwanted muscle pain. Plan your nutrition! This means organising a meal plan for yourself and making sure you have all you need to keep your body properly fuelled for the week ahead. If you feel you need support with your nutritional needs, you can get in touch with a Herbalife Nutrition Member by clicking here. But most importantly – make sure you have fun! Come back tomorrow for Day 9 of the 21 Day Challenge and another great workout with Nile Wilson.